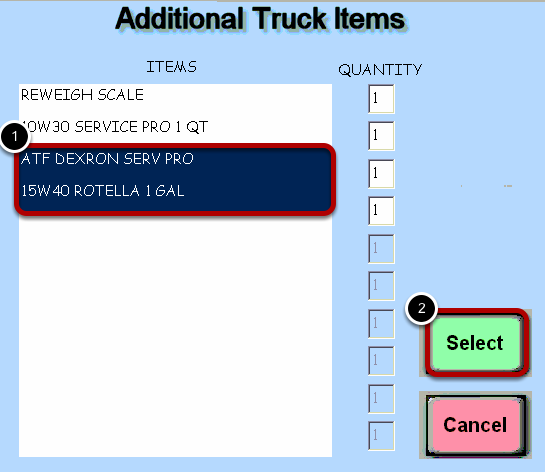 TravStar1 Point Of Sale SystemRegister Manual Truck Fleet Transactions (TFT)How Do I Add an Item within a TFT? How Do I Add an Item within a TFT? This lesson will teach you how to add an item to a TFT from the Fleet Data Entry screen. From the Fleet Data Entry screen, touch the "ADD ITEMS" buttons. (1) Touch the item(s) that you want to add to the transaction. The item(s) have now been added to the transaction. Continue by completing the Truck Fleet Transaction. Prev: How Do I Setup and Process a TFT with a Cash Payment? Next: How Do I Add an Item to a TFT After I Ring the Sale?